When it comes to whirlybirds in Canberra we are the professionals with over 29 years experience in the roofing industry and a price and service that can’t be beaten! 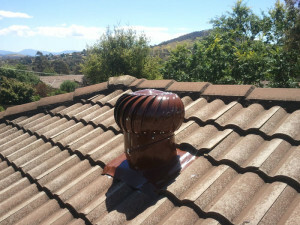 Canberra’s Whirlybirds can design your roof to provide ventilation to suit your cooling needs for this coming summer. With the experience and knowledge to assist you with your decision, we are here to help you make the right one. Whirlybirds can reduce summer temperatures inside your roof, help the performance of insulation and reduce the cost of running your air-conditioning. With a huge selection of colorbond colours to choose from we can supply and install whirlybirds to match your roof.